Some plants like the pea plant climb up other plants or fences by means of tendrils. These tendrils are sensitive to touch. When they come in contact with any support, the part of the tendril in contact with the object does not grow as rapidly as the part of the tendril away from the object. This causes the tendril to circle around the object and thus cling to it. More commonly, plants respond to stimuli slowly by growing in a particular direction. Because this growth is directional, it appears as if the plant is moving. Let us understand this type of movement with the help of an example. Fill a conical flask with water. Cover the neck of the flask with a wire mesh. Keep two or three freshly germinated bean seeds on the wire mesh. Take a cardboard box which is open from one side. Keep the flask in the box in such a manner that the open side of the box faces light coming from a window (Fig. 7.5). After two or three days, you will notice that the shoots bend towards light and roots away from light. Now turn the flask so that the shoots are away from light and the roots towards light. Leave it undisturbed in this condition for a few days. Have the old parts of the shoot and root changed direction? Are there differences in the direction of the new growth? What can we conclude from this activity? Environmental triggers such as light, or gravity will change the directions that plant parts grow in. These directional, or tropic, movements can be either towards the stimulus, or away from it. So, in two different kinds of phototropic movement, shoots respond by bending towards light while roots respond by bending away from it. How does this help the plant? Plants show tropism in response to other stimuli as well. The roots of a plant always grow downwards while the shoots usually grow upwards and away from the earth. 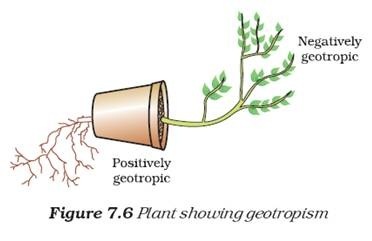 This upward and downward growth of shoots and roots, respectively, in response to the pull of earth or gravity is, obviously, geotropism (Fig. 7.6). If ‘hydro’ means water and ‘chemo’ refers to chemicals, what would ‘hydrotropism’ and ‘chemotropism’ mean? Can we think of examples of these kinds of directional growth movements? One example of chemotropism is the growth of pollen tubes towards ovules, about which we will learn more when we examine the reproductive processes of living organisms. Let us now once again think about how information is communicated in the bodies of multicellular organisms. The movement of the sensitive plant in response to touch is very quick. The movement of sunflowers in response to day or night, on the other hand, is quite slow. Growth-related movement of plants will be even slower. Even in animal bodies, there are carefully controlled directions to growth. Our arms and fingers grow in certain directions, not haphazardly. So controlled movements can be either slow or fast. If fast responses to stimuli are to be made, information transfer must happen very quickly. For this, the medium of transmission must be able to move rapidly. Electrical impulses are an excellent means for this. But there are limitations to the use of electrical impulses. Firstly, they will reach only those cells that are connected by nervous tissue, not each and every cell in the animal body. Secondly, once an electrical impulse is generated in a cell and transmitted, the cell will take some time to reset its mechanisms before it can generate and transmit a new impulse. In other words, cells cannot continually create and transmit electrical impulses. It is thus no wonder that most multicellular organisms use another means of communication between cells, namely, chemical communication. If, instead of generating an electrical impulse, stimulated cells release a chemical compound, this compound would diffuse all around the original cell. If other cells around have the means to detect this compound using special molecules on their surfaces, then they would be able to recognise information, and even transmit it. This will be slower, of course, but it can potentially reach all cells of the body, regardless of nervous connections, and it can be done steadily and persistently. These compounds, or hormones used by multicellular organisms for control and coordination show a great deal of diversity, as we would expect. Different plant hormones help to coordinate growth, development and responses to the environment. They are synthesised at places away from where they act and simply diffuse to the area of action. Let us take an example that we have worked with earlier [Activity 7.2]. When growing plants detect light, a hormone called auxin, synthesized at the shoot tip, helps the cells to grow longer. 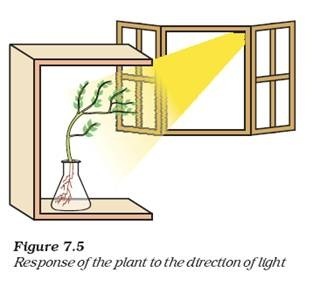 When light is coming from one side of the plant, auxin diffuses towards the shady side of the shoot. This concentration of auxin stimulates the cells to grow longer on the side of the shoot which is away from light. Thus, the plant appears to bend towards light. Another example of plant hormones are gibberellins which, like auxins, help in the growth of the stem. Cytokinins promote cell division, and it is natural then that they are present in greater concentration in areas of rapid cell division, such as in fruits and seeds. These are examples of plant hormones that help in promoting growth. But plants also need signals to stop growing. Abscisic acid is one example of a hormone which inhibits growth. Its effects include wilting of leaves.